MortgageBot offers software solutions to allow mortgage industry professionals determine who the legitimate borrowers are without wasting their valuable time and energy evaluating those that prove to be fraudulent, which is currently a major problem in the industry. Their current products are powerful tools that act as key resources for professionals in the industry. Experian® Fraud and Identity Solutions’ elite and robust Authentication Services Level Three are the latest and most sought after solutions. They also provide software for simple mortgage application processing, pricing and more. The products offered by mortgage bot are useful for independent mortgage brokers and large financial institutions. While MortgageBot offers a number of different software solutions for the mortgage industry that address all basic needs, what sets their services apart is the unique authentication process that they use to prevent mortgage fraud. Level three is what is truly unique from MortgageBot as the first two levels are common authentication features. This step is the ‘Advanced Identity assessment’ which uses 8 ‘challenge/response’ questions that only the real borrower would be in a position to answer. These questions are often generated from Level One and Level Two verification steps. What if you could increase your mortgage volume, provide a superior borrower experience, and reduce your per-loan costs? Compete with other lenders and gain the edge with Mortgagebot PowerSite, the intelligent, online, integrated point-of-sale (IPOS) solution for automating mortgage applications, pricing, approval, and disclosures. PowerSite can be deployed in every mortgage business channel—Internet, branch, call center—or your team of professional loan officers so that borrowers can enjoy a consistent, quick, and satisfying mortgage application experience through whichever channel or channels they prefer. With PowerSite, all application data can be instantly and automatically downloaded directly into your loan origination software (LOS) system, which eliminates repetitive data entry and ensures data quality. 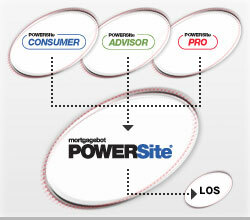 PowerSite is already helping nearly 1,000 American banks and credit unions compete and win. See for yourself how easy and affordable it can be to streamline your application process, boost your efficiency, and sharpen your competitive edge. PowerSite offers the industry’s most detailed and accurate pricing engine, so you can accurately determine the best rates, fees, and closing costs for every borrower. The PowerSite platform is an intelligent pricing, application, approval, and disclosure solution with a broad range of borrower self-service options, consumer educational resources, administrative tools, third-party integration, and added capabilities that can help you reduce costs, increase revenue, improve efficiency, and sharpen your competitive edge. The best method to contact MortgageBot is to fill out their online form that allows you to select the type of information you’re looking for; whether you want to schedule a demo, ask about pricing or discuss other things.